We have a WONDERFUL giveaway today! I am so excited to share this with you! 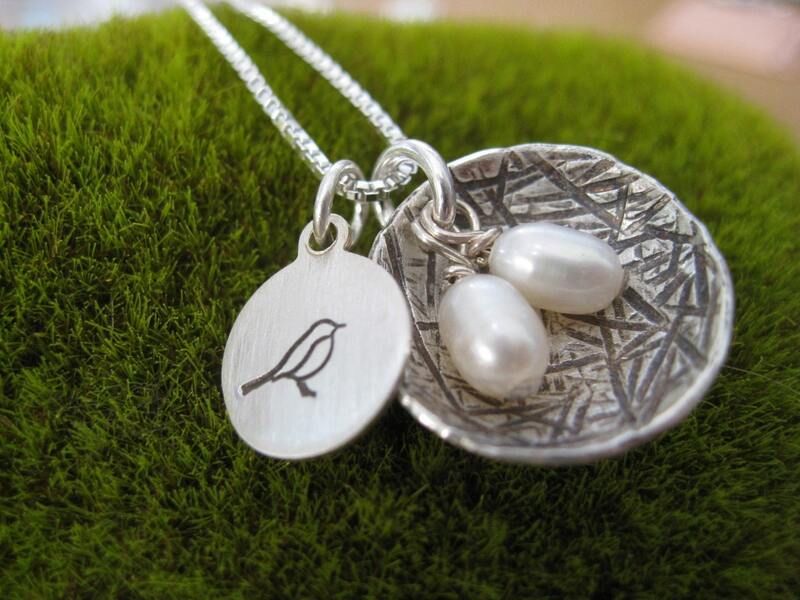 Heather, from sTuckintheCoop has offered one Six in the Nest reader a gorgeous Mama Bird Nest Necklace! This necklace can be personalized with up to 5 pearls for our winner! Heather is a stay at home mom to her two wonderful boys. Her desire to be a stay at home with her children inspired her to create her own business, and thus continue to be "sTuck in the Coop" with her boys! Check out her shop, you will see she is very talented! If, in the small chance, you don't find what you are looking for she can work with you to create what you need! These entries are all REQUIRED. 1 entry- Tell me which item is your favorite from sTuckintheCoop. So, you should have two entries already...but you really want this don't you? Okay...here ya go! 1 entry- Share this on your Facebook page! Giveaway will close 1/27/2011 at 11:59pm. One winner will be chosen with Random.org and given 48 hours to reply to the email I send, if no reply, a new winner will be chosen. My favorite item is the Little Peanut necklace or the Rain Drop! I like Stuck in the Coop on Facebook! I follow Six in the Nest on Twitter! I absolutely LOVE the Loved Inside and Out necklace!! I was on their website and fell in love with the simply sterling cuff. I'm a GFC follower and LOVE your blog. I love the pearl nest necklace. We only have one in our nest but I want more :) Only time will tell home many our nest will hold. I liked stuck in the coop on facebook. What a great giveaway. I really like the one you have featured/pictured. LOVE that and perfect that you can put 5 "eggs" in since I have 5 little ones! I love the family stack necklace on their web site. Thanks so much for the chance! I am a GFC Follower (kellywcu) I like Stuck in the Coop on FB (kelly D) and my favorite item from the shop is the Family Circle Stack. i like six in the nest on facebook! My favorite sTuck in the Coop is the Family Circle Stack! I am already a sTuck in the Coop fan on Facebook! I am now following Six In The Nest on Twitter!! I am now a Six In The Nest facebook fan!! My favorite is the Simply Sterling Cuff . I love the see thru heart necklace! I liked sTuckinthecoop on facebook. I liked six in the nest on facebook. The oval fellowship mixed metal family necklace is pretty. I love the necklace with the little feet on it! I on follow SITC on FB! I liked inspired by finn on FB! I liked CSN stores on FB! I liked Bendaroos on FB! I like CrazyDog T's on FB! I like Charm Factory on FB! I like BabyLegs on FB! I like softlips on FB! I like Purex on FB! I like Applied Labels LLC on FB! I like Cowgirl Chocolates on FB! I like Luster Premium Whitening on FB! I like Costume Squad on FB! I like Zylie Bear on FB! I like Yesteryear Soap Company on FB! I like Tag*A*Long on FB! I like Mom, Dad, and Baby on FB! I like PetCakes on FB! My favorite is the Sparkling Heart necklace. I like STuck in the Coop on Facebook-Lisa R. P.
the Itty Bitty Dangles earrings are sooooo cute. I like the mix it up trio mixed metal necklace and can see myself wearing it everyday! I like the costume squad facebook page... amongst others and I told them you sent me! I voted for you on PFB! I friend requested TruKid on FB! I also forgot to put my e-mail in above comment!!!! I liked 'Right On The Walls' on FB! I voted for Six in The Nest on PFB! My favorite is the Mama bird necklace! I liked sponser on FB! I love the necklace listed, as well as the copper mama bird one! Voted for you today @ Picket Fence Blogs. I looked at their site but I LOVE the one you pictured the best! It's awesome!! Voted for you on "The Fence"
I like Posh Pads on FB! I like Filly Princess on FB! I follow you and I lvoe the single initial necklace most. I like six in the nest on facebook. I follow you on GFC. I really LOVE the Love Letters Mixed Metal Collection necklace! I also like the Family Squared necklace as well! I like sTuckintheCoop on FB.